After a winter season skiing near Lake Tahoe, we already knew some of the advantages of our Element and as we became more familiar we were able to validate our reasoning behind choosing a Honda. A few short road trips also got us ready for a longer trip with our ECamper. We still didn't know what to expect, but assumed that driving along the coast as far north as British Columbia, and then heading into the Cascades, we could be exposed to just about anything, from rain to snow. And sure enough, we hit more weather than we actually had anticipated, but survived just fine. 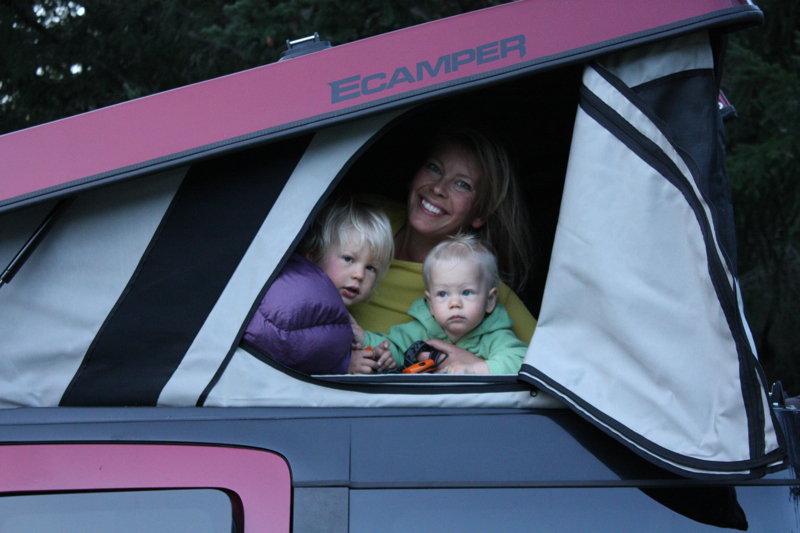 So looking back, how did the ECamper hold up with a family of four on the road for five weeks? With two youngsters in car seats, we knew we already had a challenge every night getting set up to sleep two (usually one adult and one kid) up in the pop top, and two down below. Already from some of our shorter trips, we knew we could actually get everything rearranged and set up from inside. So in a downpour we never actually had to get out of the car to get to bed. This came in handy as we headed north into the rain forests of the Northwest. Being a Honda, we figured we had a reliable vehicle and after a winter in the mountains driving through snow and rain and then a long trip on small coastal roads, our expectations were confirmed. Even without the ECamper, we would have been happy, but with the pop top, we were self contained and could park just about anywhere (legal) and spend the night in relative comfort. Some basics of the ECamper, as noted, the entire thing can be popped up and put away from inside the car, even with two kids in car seats and a months worth of camping luggage, it just takes a bit of creativity. Putting the pop top up is an easy process, just two small clamps above the driver and front passenger doors that can be reached with an arms width crack in the window, and two additional clasps on the back are released from straps hanging down from where the sunroof was. The sunroof is also the easiest way to to get into the pop top, although it's also easy to climb in from outside as well, using the back wheels as a ladder. The ECamper is well ventilated, so it's easy to adjust temperature and airflow with built in screens, or by opening the canvas flaps all the way. The flaps open up along the entire back of the pop top, as well as a couple feet forward along the sides. There's a nice cushion over the entire bed platform, so it's easy to get a good nights sleep. On our five weeks, four of them in rainy weather, we only had one incident where the ECamper left us a bit wet, and likely this was more due to pilot error than anything else. We backed into a rain storm on Tofino looking out over the Pacific Ocean and as the wind and rain increased through the night water somehow started to seep in. My guess though is had we not gone for the ocean view, we could have stayed high and dry since otherwise we haven't had any problems with getting wet before or after. The ECamper with it's combination of Honda Element versatility, with the practicality of of a pop top, has created an ideal vehicle, not only for day to day use but also to hit the road for a few days, few weeks or longer. It's going to be hard to part with once we do have to head back to Norway after our year of adventuring. Yeah! We have one too and it's awesome! How did your rear suspension fair with all the gear? Ours gets sacked out pretty hard for mountainbiking. Any mods? I've got tons of ideas but not enough time or $. One bit of advice...keep a chamois to dry off the top and wipe off all the bugs before putting it down and it will stay fresh longer. Enjoy! Thanks so much for your awesome blog. I'm considering an ecamper for my element, which is how I found your blog. It turned out to have some of the best "real world" info on the ecamper that I found, and it helped me make a decision. Your children are really lucky. They will grow up with a unique perspective, as well as bunch of great memories. Thanks for the inspiration and I hope you enjoy your journey.